Unfortunately, fans will have to say goodbye to Gwenpool, but the good news is they don't have to do it quite just yet. 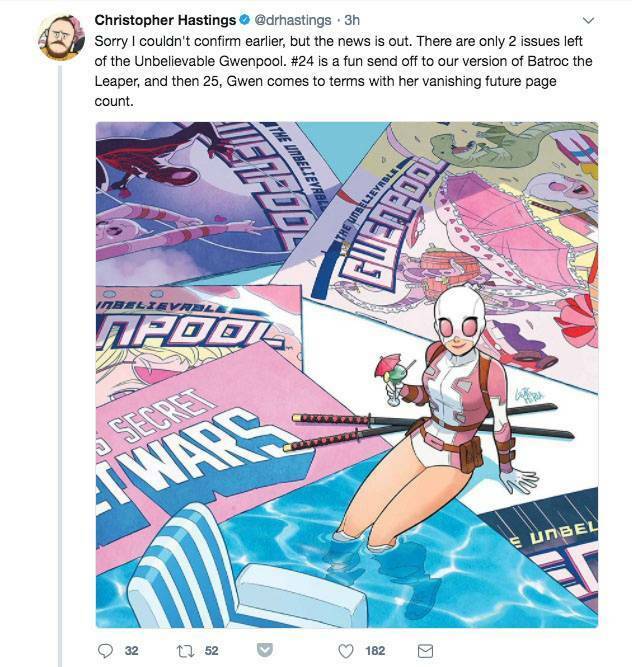 Unbelievable Gwenpoolwriter Christopher Hastings confirmed the news earlier today, signaling that the series will officially come to a close with issue #25. While there are only two issues left until Unbelievable Gwenpool rides off into the sunset, Gwenpool will be dealing with it like anything else, and that means breaking the fourth wall. "Sorry I couldn't confirm earlier, but the news is out," Hastings said. "There are only 2 issues left of the Unbelievable Gwenpool. #24 is a fun send off to our version of Batroc the Leaper, and then 25, Gwen comes to terms with her vanishing future page count." Hastings believes these last two issues will be some of the series' strongest and promises a worthwhile ending. "I think these are two of the best issues in the series, with @Gurihiru returning to give it the best blow out ending we could ever ask for," Hastings teased. "There are still surprises in these stories, and some of my favorite moments. Hastings isn't quite ready to truly say goodbye but wants the talent involved to be recognized for their hard work. "I'm not going to eulogize a book that isn't over for another 2 months, but I will say it was a true example of the power of collaboration," Hastings said. "Every person who is credited on this book gave a piece to this thing that had such a WEIRD beginning, and made it into what it is now." The Unbelievable Gwenpoollaunched in May of 2016 with The Unbelievable Gwenpool#0, officially launching with Gwenpool #1 on April 13, 2016. Artist G Gurihiru has been heavily involved with the series alongside Hastings, but Irene Strychalski also had a huge part in bringing Gwenpool to life. The series will conclude with The Unbelievable Gwenpool #25, and you can find the official description of the issue below. "LOST IN THE PLOT PART 2! Gwen's future page count is running low…but her thirst for super hero fun and adventure is as high as ever! What better time than the present to knock off "join the Avengers" from her bucket list?" The Unbelievable Gwenpool#25 lands in comic stores on February 28, 2018.